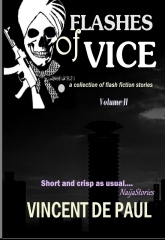 Flashes of Vice: Vol II is now available in bookstores in Nakuru, Kenya. It is Available at Ereto Bookshop, Nakuru, retailing at Ksh.350 and my living room/mobile bookstore to get your copy today, either paperback (Ksh.350 in Nakuru, Ksh.350 + 200 shipping from the rest of Kenya) or E-book edition at Ksh.150. Go grab yourself a copy and enjoy the best of bold, daring, and thrilling flash fiction stories. Contact Mirriam Makau +254 718 621 014 to buy.